Greetings again from the darkness. With this week’s NASA announcement of the discovery of water on Mars, it seems necessary to point out that director Ridley Scott’s latest was not actually filmed on the red planet, but rather in the Jordan desert. OK, maybe not necessary, but it does serve as a reminder that the film (based on the popular book from Andy Weir) may be filled with science … but it’s also fiction – hence the label Science-Fiction. If you were one of THOSE who actually paid attention in science classes and read the optional material, then you will probably find much fault in the details. For the rest of us, it’s a pretty fun ride. Space has long been a popular movie topic, and a key to such favorites as 2001: A Space Odyssey, Alien, Aliens, The Right Stuff, Contact, Space Cowboys, Armageddon, Moon, and most recently Gravity and Interstellar. And of course there are the immensely popular franchises of “Star Wars” and “Star Trek”, which both chose a different path than the “grounded” nature of the others. 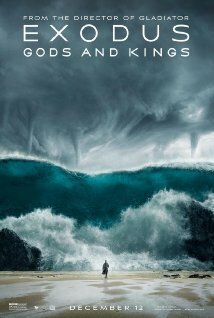 This latest film may actually have as much in common with Cast Away as it does with any of the space-based films, and while many movies these days seem to be advertisements for Apple, this one is owed a debt by the duct tape company. Commander Lewis (Jessica Chastain) and her crew (Matt Damon, Michael Pena, Kate Mara, Sebastian Stan, Askal Hennie) are hard at work on their Mars mission when a severe storm causes them to evacuate in panic mode. 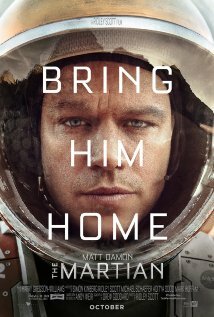 When the storm hits, Damon’s astronaut Mark Watney is lost and presumed dead. Once it’s realized that Watney survived and has every intention of being rescued, the film kicks into gear. There are three separate stories we follow: the ingenious and spirited survival mode of Watney, the politics and brilliance of the NASA organization, and the crew who now believes Watney’s rescue is their responsibility. The NASA group is led by director Teddy Sanders (Jeff Daniels) and includes support work from Chiwetel Ejiofar, Kristen Wiig, Sean Bean, MacKenzie Davis, Donald Glover and Benedict Wong. Taking the approach of an adventure film with the MacGuyver of all Botanists, Damon’s charm and humor stand in stark contrast to the annoyances of the two leads from Gravity, and provide a mass appeal that should make this entertaining for most any viewer. This approach allows us to imagine ourselves stranded on Mars, and whether we would panic or consider ourselves Space Pirates. There is also a lesson here for all students out there … pay attention in Science class! For the rest of us … “get your a** to Mars”! Greetings again from the darkness. The best dramatic writers thrive on creating a story filled with intricacies, multi-faceted characters, mis-direction, and a complex interweaving of sub-plots. Cormac McCarthy has proved he is one of the best such writers through his highly successful novels … some of which have made the transition to the screen: All the Pretty Horses, The Road, and of course, No Country for Old Men. This, however, is his first attempt at an original screenplay. Describing it as a disappointment is a severe understatement. The cool parts of this movie: Bruno Ganz as a diamond dealer in Amsterdam and the two live cheetahs. The parts of the film that could have been interesting: the wardrobes of all main characters, Javier Bardem’s Brian Grazer-inspired hairdo, the line-up of luxury vehicles (Bentley, Ferrari, etc), and the “bolito”. The parts of this movie that were never going to work: the opening scene with Michael Fassbender and Penelope Cruz frolicking under the sheets, dialogue that is too poetic for the characters, Brad Pitt as his grown up scammer from Thelma and Louise, Fassbender’s Texas accent, and Cameron Diaz (gold tooth, silver fingernails, cheetah tats). The part of this movie that is an outright disgrace: Cameron Diaz doing the splits while having intimate relations with the windshield of Bardem’s Ferrari … maybe this idea came from Joe Eszterhas after being rejected as too outlandish for Showgirls. Chances are viewers will fall into two camps: thinking this is a wild and crazy ride inside the Mexican drug cartel, OR believing this is one of 2013’s sloppiest, messiest, most pointless and confusing wastes of time in a movie theater. I am solidly in group two and can’t even recommend you see this to determine where you fall. The cast is filled with A-listers: Javier Bardem, Brad Pitt, Michael Fassbender, Penelope Cruz, and Cameron Diaz. The writer is a renowned novelist. The director is three time Oscar nominee Ridley Scott. How could it miss? Even the best actors can sometimes be miscast. Even the best writers have work best left unpublished. Even the best directors lose control of a project. It’s a movie tragedy when all those things happen in a single film. I guess the best running joke throughout the movie is that Fassbender’s titular character is constantly receiving counseling, rather than offering it. At its core, the story is just another drug deal gone bad (do any movie drug deals ever go “right”?). With it’s unusual visuals, unrealistic conversations, and convoluted sub-plots, this one would have played better as a slideshow. Instead, I am left with this: I’ll never look at a smudge on my windshield the same again. Greetings again from the darkness. 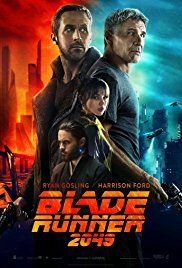 Hard to argue with the box office success when director Ridley Scott teams up with Russell Crowe (Gladiator, American Gangster). Can’t really challenge the resume of writer Bryan Helgeland (Mystic River, L.A. Confidential) or the acting chops of Cate Blanchett, Max von Sydow or William Hurt. And only the most cynical would deny the appeal of the Robin Hood legend … stealing from the rich to give to the poor. So why is it that I feel so cheated and let down by this version? First of all, it is presented as a prequel to the legend. This is the story of how Robin and his band of merry men (and Maid Marion) came to be united. If it is a prequel, why then is Robin (Russell Crowe) so darn old? There is even a line in the film noting the advanced age of King Richard the Lionheart being 40 or even more! For the times, this was considered old, yet somehow Robin is ready for a career change. The best parts of the film are the amazing sets and pieces – both the villages and the boats. And we all know that Mr. Scott can film a massive battle scene! There is a touch of Gladiator, Saving Private Ryan and Braveheart in many scenes. All fine, but what I really missed was the flirtatious banter between Robin and Marion. Maybe I am biased, but a Lorena Bobbitt threat doesn’t strike me as light-hearted bed chamber conversation. My biggest complaint is with the script. It just felt clunky and messy. A couple of scenes were apparently included just so Mark Strong could scowl … and he has a great scowl! Other scenes and lines were seemingly included just to give the film a complex feel. Probably too complex for what it really is. Oscar Isaac as Prince John was the funniest and most interesting character in the film. The preview made him look like a buffoon, but the film gave him more depth … and a couple of great lines. Danny Huston as Lionheart, Mark Addy as Friar Tuck and Matthew Macfadyen as the Sheriff of Nottingham all add to the luster, but remember this is prior to Robin’s ongoing battles with the Sheriff. Be cautious with younger kids as it is a strong PG-13. The battle scenes are entertaining, but this is one legend that did not need its roots exposed.